There are a lot of infomercials promoting home workout equipment these days, but most of the equipment that is being advertised is, for want of a better word, junk. If you are looking for good weight lifting equipment for the home then you need look no further than resistance bands and dumbells. With these two peices of equipment you can do almost any exercise – and you don't need to give up a huge amount of space in your house either. Dumbells can be used for overhead presses, triceps extensions, bench presses and curls, as well as for squats and lunches. Resistance bands can be used for unloaded pullups, assisted dips, and also to provide resistance for other exercises in their own right. 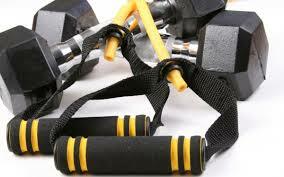 They can help to improve strength and stability and force you to develop a good range of motion as you exercise. There is no need to invest in a barbell or a weight bench – or expensive exercise equipment, if you do not want to. However, a high quality barbell is a great choice if you are serious about performing compound lifts and getting as strong and fit as possible.